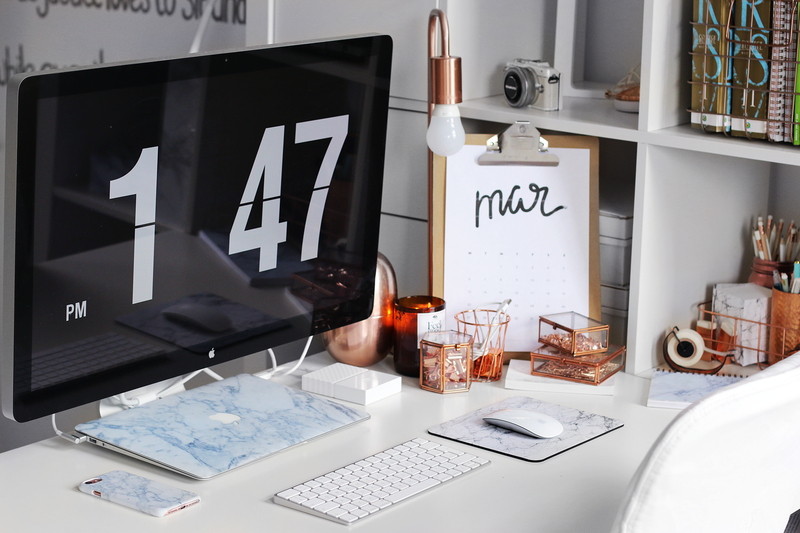 The key to having an inspiring work or study space is a clean and organized desk. If you're struggling with getting your work done or feeling unmotivated to study, think about the enviroment you surround yourself in. I always make sure that my desk looks very tidy and neat. My desk is my work & study space (okay occasionally I also declare my couch and bed as my office, but shhht don't tell), so it's probably the most important area in my loft. 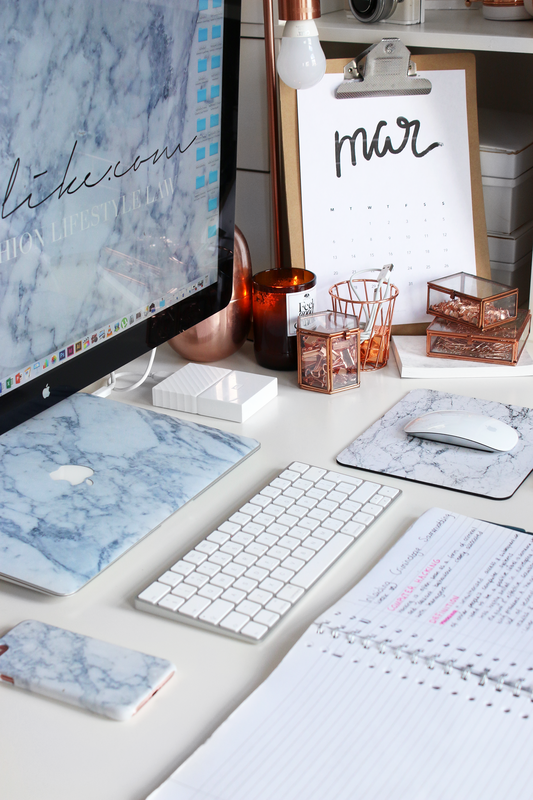 Today I'm going to show you all the ins and outs of my desk by giving you my desk tour. Hope you enjoy! Organizing your desk is very important if you want to stay focused during your study sessions. I like to achieve that by using different ways to store my school supplies. For my pins and paper clips I used three storage Laif & Nuver boxes from glass. I love the way it looks, because it shows their pretty rose gold color while still being organized. I also used a little basket for my Invisibobble and lip balm - always need those when I am studying! For my pens, pencils and markers I created this 'office supplies basket'. I wanted to keep my items all in one place that would be easy to access. For my pens, I used some rose gold spray paint and a sponge to create the look of rose gold foil. For my highlighters and pencils I used two mason jars that I spray painted rose gold. I think this DIY turned out stunning! 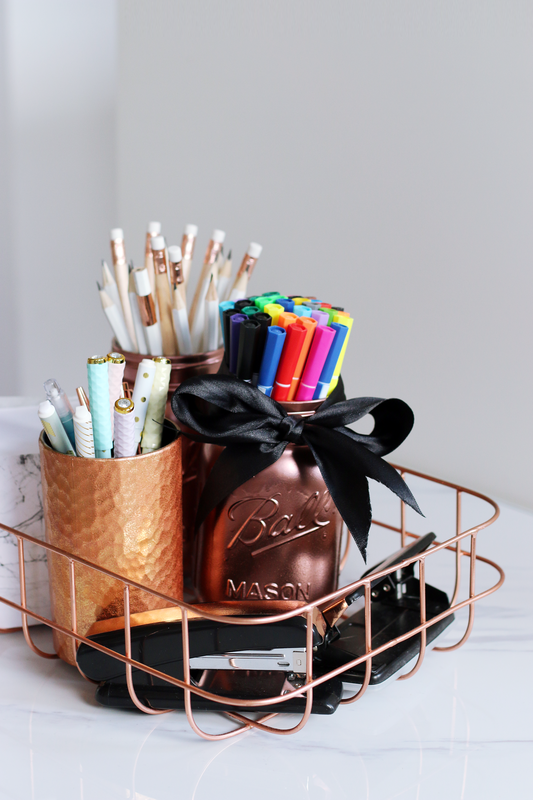 You can find the DIY rose gold mason jar pen holder here. I also added my DIY rose gold stapler and sticky tape holder. If you want to check out that DIY, you can find it here. I personally think that storing your school supplies this way is beautiful, but practical at the same time. THE KEY TO KEEPING YOUR DESK NEAT & CLEAN IS TO ORGANIZE YOUR ITEMS IN SUCH A WAY THAT THEY ARE EASY ACCESS YET 'TUCKED AWAY'. Organizing your study materials can be quite hard. I usually have so many big books, spiral notebooks or handouts during the school year that I found it quite hard to store everything neatly. However, I finally found a solution! 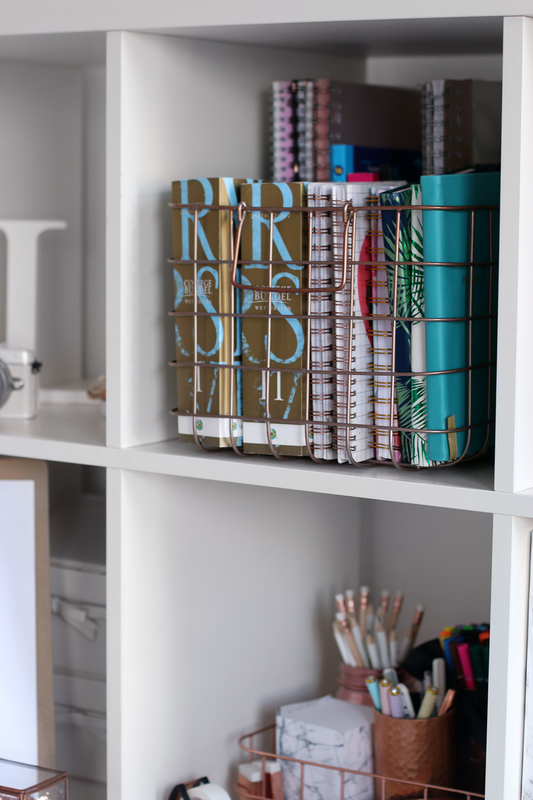 I started using this huge rose gold basket for all my books and notebooks. It looks good and I can easily pull it out of my closet. When it comes to my laptop, I always make sure that it matches my other electronics. I love the look of my matching marble MacBook Air and marble iPhone 7 case. They are both from CaseApp if you are wondering. I also matched it with the marble background of my Apple screen and my marble mouse pad from Primark. This girl loves her marble! 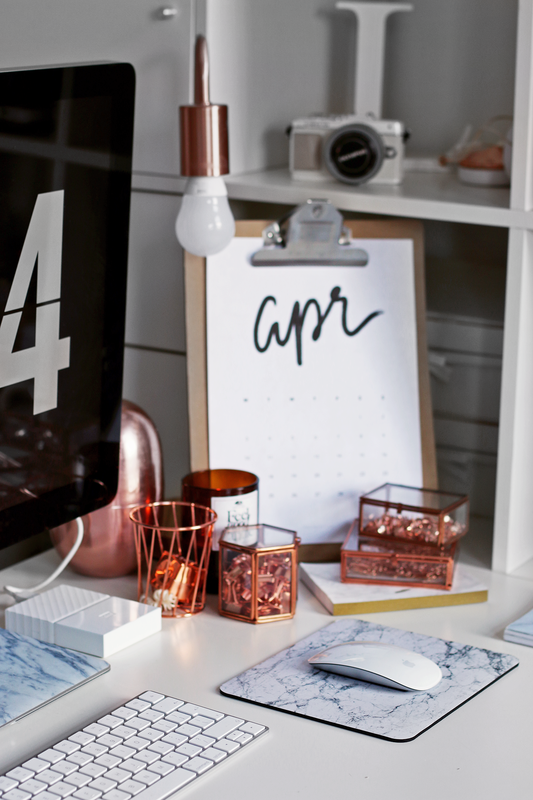 The last tip that I want to give you when it comes to organizing your desk is sticking to one theme. There are so many cute stationery items and school supplies out there, so it's hard to only choose one style. Make sure that you pick a style that matches your aesthetic and stick to it. 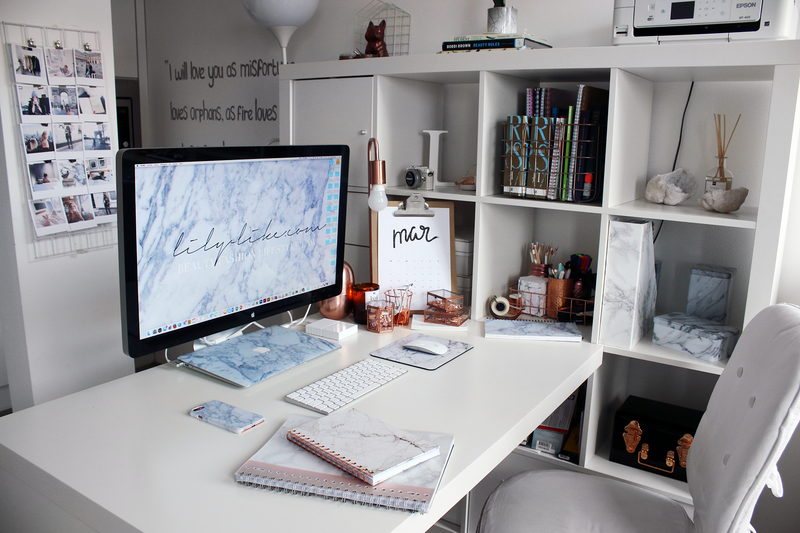 I went for a white, marble & rose gold theme with my desk, and I love it. It looks clean, organized and makes me want to study! If you want to get a better picture of my desk area, you can watch this Desk Tour video. 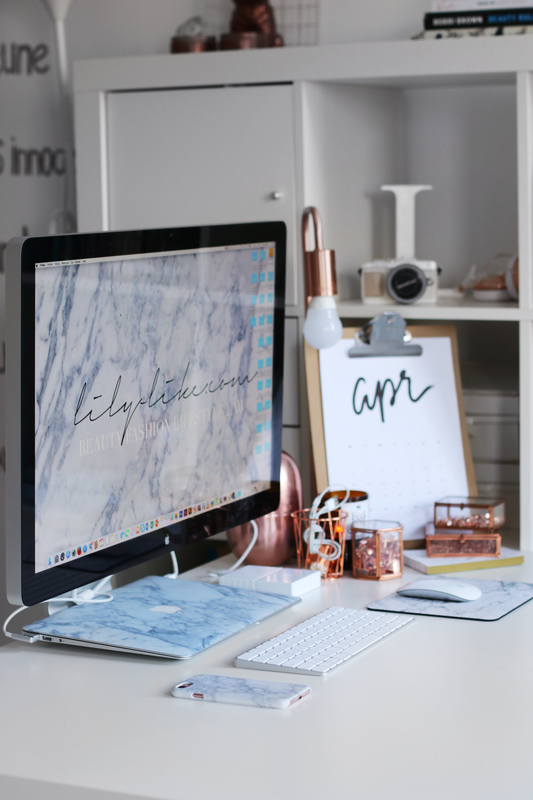 I show and explain everything on my desk there in more details, so it's definitely helpful if you are looking for some office inspiration! I hope you found it interesting to see my desk tour. I personally feel very strongly about having a neat and pretty desk, because it really boosts my productivity levels. Having a nice place where you can focus is just essential to any girlboss out there, haha! WHAT DO YOU THINK OF MY DESK TOUR? Previous Post PERSONAL | A Goodbye Letter. Hope you will manage to create a warm and neat environment like this one in your DC apartment. I love your desk tour! I agree with your tips also! I usually keep a well organized desk but I think I will do a little more on it today! Peace! 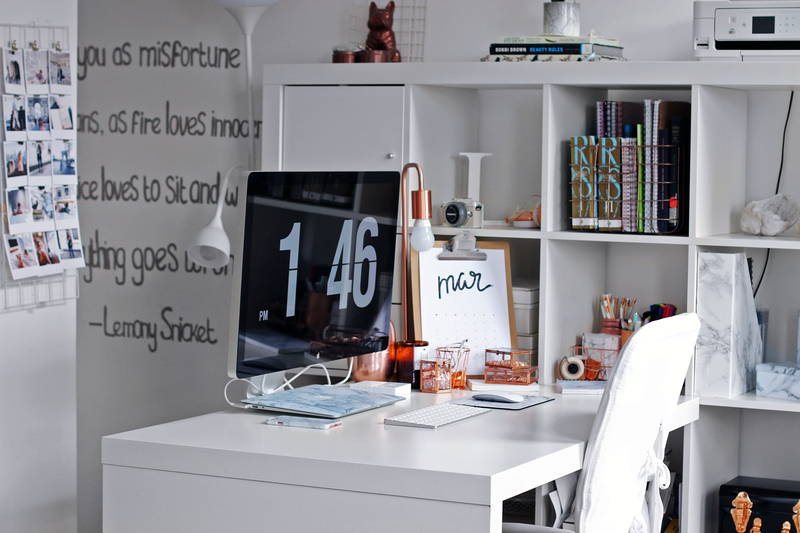 I’m a bit embarrassed to say that, but your desk area inspire me for doing mine :D I did the same thing with the Ikea shelf + a desk and put them together… I like the result so much ! You have the most beautiful desk! I love how organised you keep it. I also have the same theme on my desk! Ah! I can’t believe I found you on my Bloglovin’ recommends as I love your videos so much! Love all your Instagram account babe!!! simply amazing what you do and your videos are just so nice!! !